This will be a short post. I realized that I got so excited over the Supreme Court’s ruling mandatory Life Without Parole sentencing for juveniles unconstitutional I forgot to give you the text like I usually do. So, without further delay, here is the decision in Miller v. Alabama. Here’s hoping it saves Cristian Fernandez from a terrible fate. “Hopefully the right thing will happen and the juveniles who desire to stay in prison for life will stay in prison,” Bondi said. (emphasis mine). WTH? Who desires to stay in prison for life??? In case you don’t know, Bondi is referring to the amazing Supreme Court decision that came down on Monday, letting the states know that it constitutes an 8th Amendment violation to sentence juveniles to mandatory Life Without Parole (LWOP). I, for one, am very glad to see this happen. It seems to me that sometimes youth get sentenced more harshly than adults who commit the same crimes. I think the reasoning boils down to “because we can”. It’s “in loco parentis” gone wild. “I’ve seen firsthand juveniles commit some of the most egregious, gruesome crimes imaginable,” Bondi said. Huh. That’s interesting. She must have a reason for encouraging Florida residents to quake in their boots at the sight of a teenager. The crime statistics there must be out of sight amazing to behold. Felonies dropped by six percent, and even violent felonies have been enjoying a three year decline. Not exactly the picture of a state under attack by kids who can’t be stopped. According to the Miami Herald, 2,100 kids are currently in prison because they went to court in states where they faced mandatory life without parole sentencing for their crimes. What that meant was that the judge or jury couldn’t look at any mitigating circumstances or take anything into account. If they did it at all, then it’s LWOP for them! This is what bothers the Supreme Court a lot. They say in the summary that life without parole as a default sentencing is a cruel and unusual punishment violation because individuals are supposed to have the right to “not be subjected to excessive sanctions“. They also hold that “punishment for a crime should be graduated and proportioned to both the offender and the offense“. The biggest reason I find hope in this decision is the case of Cristian Fernandez. 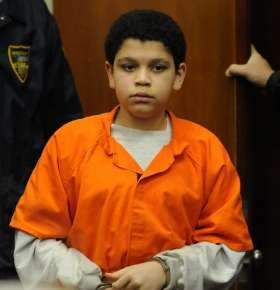 This young boy was arrested at the age of 12 and charged with the murder of his younger brother. He’s the youngest person in Jacksonville history to be tried as an adult. He’s 13 now, having spent his birthday in isolation at the Duval County Jail.